Malware from the group "Energetic Bear" has been attacking utilities in the US and Europe for 18 months. It's all fun and games when Stuxnet is wreaking havoc on Iranian nuclear power facilities, but the jokes quickly dissolve when American and European utilities come under similar attack. Symantec published a report today on Dragonfly, a group also known by the name Energetic Bear. 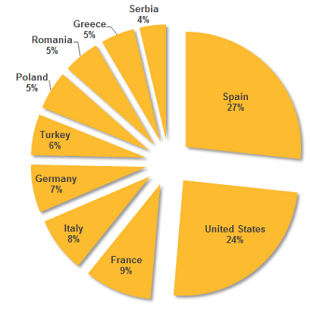 This group is behind a wave of malware attacks on utility companies in Europe and the United States over the last 18 months, with most of the affected systems being in Spain, France, Italy, Germany, Turkey, Poland, and the U.S.
"Among the targets of Dragonfly were energy grid operators, major electricity generation firms, petroleum pipeline operators, and energy industry industrial equipment providers," said Symantec on its Security Response blog. Dragonfly bears the hallmarks of a state-sponsored operation, displaying a high degree of technical capability. The group is able to mount attacks through multiple vectors and compromise numerous third party websites in the process. Dragonfly has targeted multiple organizations in the energy sector over a long period of time. Its current main motive appears to be cyberespionage, with potential for sabotage a definite secondary capability. State-sponsored cyberattacks aren't new threats by any means. Stuxnet was likely a collaboration between the U.S. and Israel to keep Iran's nuclear programs (weaponized or not) crippled, while Chinese hackers have been targeting U.S. systems for years. Symantec contacted those impacted by the malware prior to the blog publication, so hopefully the repair process is quick and largely painless.